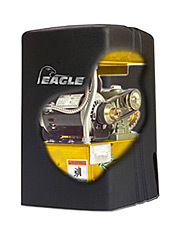 Safe and secure gate operation is made quick and easy with pad-mount gate operators from Eagle. 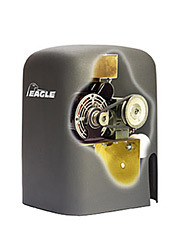 Enjoy quality and reliability with the Eagle-I Slide Gate Operator. Rated for continuous duty, Eagle-1000 operators deliver the reliable power you expect for a wide range of residential sliding gates. Installation is made simple with the advanced features you most often need standard on every operator. Want your transmitter to work like a 3-button station-click to open, click to stop, click to close? Simply select Stop-Reverse on the Diamond Control Board.Heavy, downhill applications require a motor brake. Select Motor Brake on the Diamond Control Board and you've got it.2-Wire Master Slave and Global Inputs give you full communication with accessories from both master and slave operatorsPartial Open, One Pass . the advanced features you want come standard. With four models to choose from, Eagle-2000 is the reliable choice for all your commercial and industrial needs; combining big heavy gates with high traffic use for smooth powerful operation. 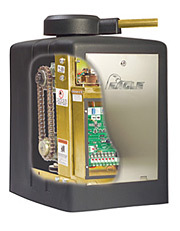 Install Eagle-2000 for reliable power. Installation is made simple with the advanced features you most often need standard on every operator; features like Stop-Reverse allowing your transmitter to work like a 3-button station, or motor brake for added control on downhill applications. Dual gate Master/Slave operation has never been easier. Just two wires provide full Master/Slave communication. Global inputs between master and slave operators allow connection of any accessories to either the master or slave and the Diamond Control Board does the rest. Apartment buildings, gated communities, industrial sites-anywhere there are big gates and a lot of traffic, Eagle-APT is the best operator for the job. The Eagle-APT series of operators is designed and built for the busiest sites, delivering the rugged durable power you need for these demanding applications. 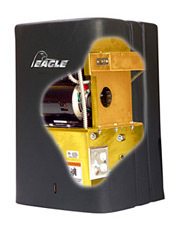 Install Eagle-2000-APT for reliable power. 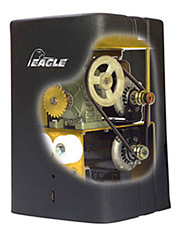 Safe and secure gate operation is made quick and easy with pad-mount gate operators fro Eagle. 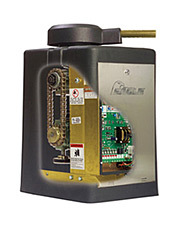 Enjoy quality and reliability with the Eagle-II Swing Gate Operator. Max Gate Size: 18' & 600lbs. 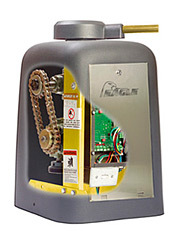 The Eagle 100 Residential Swing Gate Operator comes standard with the features you most often need. Need the exact amount of Open/Close Delay for dual leaf gates-The precise delay is programmed in the Diamond Control Board. Partial Open, One Pass, Stop-Reverse, and more . Advanced Features come standard.